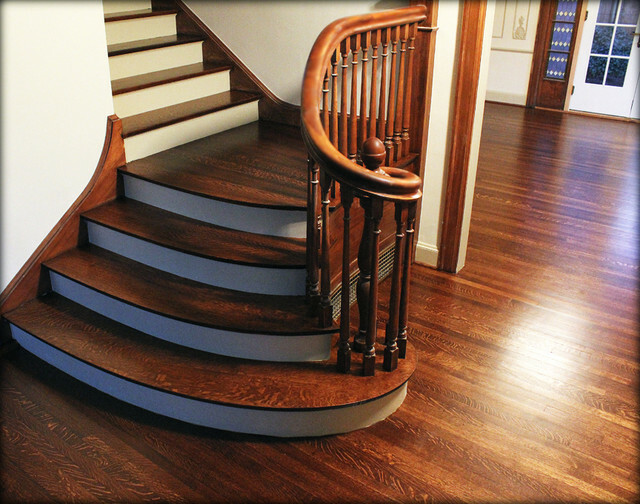 Rift and Quartered Oak Refurbish - Craftsman - Staircase - Salt Lake City - by Signature Floors, Inc. Painted risers allow the depth of the quartersawn stair treads and landing to present themselves as a feature of the house, drawing the eye to the wood's natural beauty. 3. Invest in Your FloorsDon’t be afraid to budget generously for your floors, Barber says. “Look at it as an investment. If it’s properly selected and installed, it’ll last for a hundred years. A good wood floor adds a lot of value. People spend a lot on their kitchen cabinetry, upgraded lighting and automation, but those things will eventually need to be replaced.” Signature Flooring refurbished the original rift- and quarter-sawn oak flooring in this Salt Lake City home, built in the early 1900s. “It’s amazing how the flooring can stay with a home from generation to generation,” Barber says. “A timeless hardwood floor will age like fine furniture.”See more of this projectMore: For more information on Gary Barrus and Leigh Barber and examples of their work, visit Signature Floors’ Houzz profile.This story was written by the Houzz Sponsored Content team.